High Resolution Electron Energy Loss Spectroscopy (HREELS) is a vibrational spectroscopy based on the illumination of a substrate under vacuum by a monochromatized electron beam with a kinetic energy of a few eV followed by the analysis of the scattered electrons with a resolution of a few meV. On their trajectory, the electrons exchange energy quanta with surface excitations that include plasmons, phonons, interband transitions, gap states. 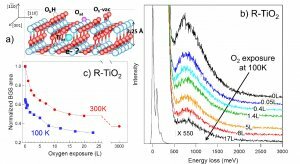 The INSP group have focused on band gap states (BGS) in the case of the rutile TiO2(110) surface. Although the vacancies in the bridging oxygen rows (Figure 1-a), that are well characterized by near-field microscopy, undoubtedly contribute to this, the role of titanium interstitial is unclear. The difficulty comes from the apparent similarity of the spectroscopic fingerprints of the two defect states and the inability to control the depth probed by the techniques that are currently used (scanning tunneling microscopy or photoemission). A first indication comes from the residual BGS component which remains even after a strong exposure to oxygen which is known to cure surface vacancies (Figure 1-b,c). Are BGS originating from titanium interstitials affected by oxygen exposure and in which conditions ? To distinguish the two contributions, we have used an original method of surface annealing via a hot filament facing the sample that allows the annealing of the sample surface only. The surface temperature is precisely determined by HREELS via the Bose-Einstein statistics of the phonon gain/loss ratio. At 400 K, the progressive increase in BGS intensity as the square root of the time has been attributed to the diffusion of titanium interstitials since oxygen vacancies are only formed above 800 K. The view has been supported by cycles of annealing at various temperatures (creating defects) followed by exposure to oxygen (healing defects) which result in outward diffusion/oxidation of titanium interstitials and lead consequently to defect-free surfaces via a depletion in sub-surface titanium interstitials. In parallel, the contribution to BGS of oxygen vacancies was singled out by combining exposure to water vapour with electron bombardment at energies precisely defined by electron stimulated desorption processes. Exposure to oxygen of a reduced TiO2(110) surface (R-TiO2) : a) Structure of the TiO2(110) surface with Ti and O atoms in blue and red, respectively. Main defects appear in figure : oxygen vacancies (Obvac), titanium interstitials (Tiint), hydroxyl groups (ObH) ; b) Evolution of the BGS intensity upon exposure of R-TiO2 to molecular oxygen ; c) Corresponding integrated BGS intensity à 100 K et 300 K.
On the basis of those surface preparations in which BGS are dominated by a unique type of defect, the EELS analysis as a function of the detection angle allowed to draw the depth profile of BGS (Figure 2-a,b). Within the dielectric picture of the electron-substrate interaction, the variation of the momentum transfer parallel to the surface can be associated to an effective probing depth. Surprisingly, beyond the absence of charges at the extreme surface, it was evidenced that the BGS profile as well as its dispersive behavior are independent of the nature of the defects. (This point is in perfect agreement with previous results that were obtained by resonant photodiffraction (Phys. Rev. Lett. 100 (2008) 055501 and 108 (2012) 126803). The lack of dispersion beyond a certain value of the momentum transfer (Figure 2-c) can be interpreted as the radius of the related polaron. Off-specular BGS intensity : a) Evolution of the off-specular BGS intensity that allows an estimate of the probed dielectric depth (inset) and b) the determination of the BGS intensity profile and then c) the dispersion of the BGS. 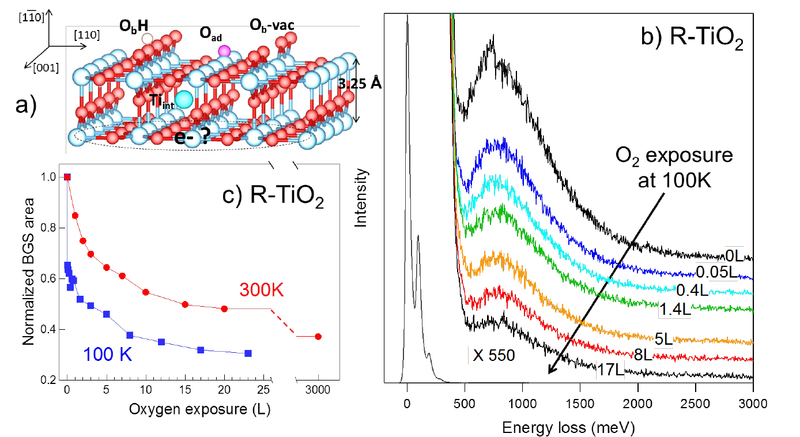 BGS of reduced surfaces (R-TiO2) mainly come from oxygen vacancies while those of surfaces directly annealed by the hot filament (A-TiO2, see text) mostly originate from titanium interstitials. Beyond the understanding of the origin and profile of excess electrons that allows the interpretation of experiments that were so far contradictory, this work continues through the study of the correlation between the gap states and the transport properties of the polarons, and that as a function of the nature of the TiO2 polymorph (anatase vs rutile). The analysis relies in particular on the dielectric modelisation of HREELS spectra.